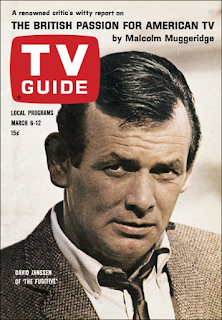 The brooding visage of David Janssen graces this week's cover. Janssen is in the second of four seasons playing Dr. Richard Kimball, the hero of the hit ABC series The Fugitive. Janssen the actor shares many similarities with Kimball the fugitive, among which is a lack of comfort with his surroundings. His friend, novelist Bernard Wolfe, comments that "David is not a fanatically dedicated person. If he were, all this grueling work would have more meaning for him. But he is not dedicated. He has great doubts as to the ultimate aim of it all, as to where it is leading him." Janssen in fact houses a number of torments: his heavy drinking, which Janssen claims has diminished while doing The Fugitive, but would always remain a part of his life; his ulcer (caused, Janssen wryly notes, by "thinking"); his heavy smoking (two to three packs a day); and the fatigue of his grueling schedule of 14-hour days filming a show in which he is in virtually every scene. When told that executive producer Quinn Martin "speaks grandly of five more years" of The Fugutive, Janssen dully replies, "Five more years? Contractually, I suppose I would have to put in five more years, but -" The Fugitive ran just about the right length of time; David Janssen, who died of a heart attack at age 48, died way too young. Personally, I don't think you need a reason to show a picture of Sophia Loren, but this week we have one. On Saturday, WTCN presents the TV premiere of Two Women, the movie for which Loren won her Oscar for Best Actress. Channel 11 advertised the movie accordingly. While this picture might be considered somewhat modest today, I'm sure that 1965 Midwest sensibilities might have been offended by the amount of Sophia's cleavage on display. 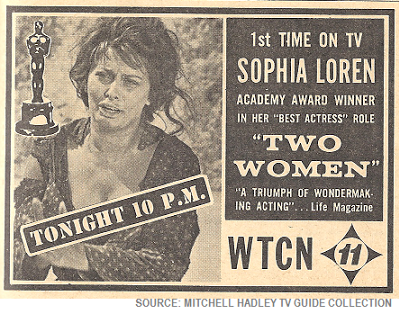 Two Women was, as I recall, an art-house movie (and Loren was the first Best Actress winner in a foreign-language film), so it's likely that most people in the Twin Cities hadn't seen it; Loren's sexpot image was well-known, however, so the station might have thought a little judicious editing was in order. Alternately, because it probably wasn't seen widely and viewers didn't know what it was about, perhaps the station wanted to create the impression that there was more to see than meets the eye. Or is that too cynical a thought? I'm just sayin'. Ed Sullivan: Scheduled guests include singer Ella Fitzgerald; Duke Ellington and his band; singer Rita Pavone; singer-dancer Roy Castle; comics Stiller and Meara; the two Carmenas, balancers; and comedian John Byner. Hollywood Palace: Host Eddie Fisher welcomes actress-vocalist Connie Stevens, comedian Jack Carter, the Marquis Chimps, the Arirang Korean ballet troupe, comedy pantomimist Ben Wrigley and the Kuban Cossacks, dance team. This contest was pretty much over at the start. With Ella and Duke headlining the Sullivan show, Palace was going to have to come up with something big to top it. Eddie Fisher, Connie Stevens and Jack Carter are OK, but the royalty that the Palace needed was already spoken for. Crown Sullivan as winner for the week. The big movie of the week is a really big one: ABC's Sunday night presentation of Judgment at Nuremberg, starring Spencer Tracy, Oscar winner Maximilian Schell, Burt Lancaster, Marlene Dietrich, Judy Garland and a cast of thousands. It's a long movie, starting at 8:00pm CT and running for three and one-half hours. And it's a heavy movie - preachy in parts, as one might expect from writer Abby Mann and director Stanley Kramer. But less than 20 years after the end of World War II, it's also a portrait of a world still trying to come to grips with the horror of the Holocaust, and a country (Germany) trying to sort out its moral responsibility. Speaking of which, there's a note that on April 11 the ABC program Discovery '65 will be telecasting David Amram's Holocaust opera The Final Ingredient, commissioned by the network*, based on the teleplay by the famed Golden Age writer Reginald Rose. "Set in the Bergen-Belsen concentration camp, The Final Ingredient relates the story of a group of inmates who attempt to hold a secret Passover Seder inside the camp, and their quest for the final ingredient, which lies just outside the camp walls." Interesting, as this article points out, that ABC conceived of this as a "Passover Opera" that might be presented annually - almost a Jewish counterpart to Menotti's Christmas opera Amahl and the Night Visitors. But it didn't become an annual broadcast - at least, as far as I know. It's available for viewing at the Paley Center - might have to check this out someday. *I'm not positive, but I'm fairly certain this was the final opera commissioned by one of the big three American commercial television networks. After this, it would be up to PBS. Let's see - there's also an article about CBS's series The Nurses, which has just been retooled with the addition of a couple of doctors; it's now called The Doctors and the Nurses. The nurses (Shirl Conway and Zina Bethune) are now supporting players to the doctors (Joe Campanella and Michael Tolan). According to producer Herb Brodkin, the move was made to improve ratings and dramatic potential: since nurses can't diagnose patients, there just weren't enough stories to carry the show. Says Brodkin, "Part of the problem was that, in making things happen in a story, nurses are handholders." Johnny Carson's doing a 15-minute sit-in, in protest of the fact that many NBC affiliates around the country (including those in New York and San Francisco) don't carry the first 15 minutes of Tonight (which at the time ran for an hour and 45 minutes), choosing instead to run a half-hour of local news. For Carson, this meant about half of the nation would miss his monologue, a situation which justifiably caused him some distress - so much so, Carson claimed, that it prevented him from appearing on-air for the first 15 minutes of the program. His "sick-in" lasts for two nights, after which he agrees to discuss things with the network. The short-term solution is that Ed McMahon and bandleader Skitch Henderson vamp for the opening segment, with Johnny coming on at the bottom of the hour to do his monologue. Within a couple of years, that first 15 will be dropped altogether, giving the show a tidy 90 minute running time. On the sports front, there's the usual late-winter fare: bowling, basketball, the odd golf tournament. The most notable event: the "first annual" Grand Award of Sport, Wednesday night at 8:30 CT on ABC, presented live from the New York World's Fair, and hosted by Bing and Kathryn Crosby. The format: "Panels of outstanding sportsmen have selected 20 winners" from a list of 83 nominees representing "the world's top athletes". The nominees included football stars Jim Brown and Johnny Unitas, boxer Cassius Clay, baseball's Sandy Koufax, basketball greats Wilt Chamberlain and Oscar Robertson, and hockey stars Bobby Hull and Gordie Howe. At the show's end, one of these winners will be chosen to receive the "Grand Award," presented by former astronaut John Glenn. I can't find another listing for the "Grand Award of Sport"; it's my guess that it was either replaced or folded into the Victor Awards, which began (coincidentally?) the very next year, 1966. NBC presents a news special Tuesday night entitled "The Pope and the Vatican," covering the concluding days of the Second Vatican Council and the radical changes (termed aggiornamento, or "bringing up to date") coming to the Catholic Church. I've been on vacation lately; anything new happening with the Pope? Finally, the British satirist and social critic Malcolm Muggerage has a witty, but also very provocative, article on "The British Passion for American Television," and what he has to say might surprise you. Rather than lengthen today's piece beyond any reasonable measure, I've chosen to devote an entire essay to the topic. Come back on Tuesday to see what it's all about. I agree that four years was an ideal run for THE FUGITIVE. In fact, the fourth year was a letdown overall--but only because the first three years rank among the best television ever for a dramatic series. I think Janssen was underrated as an actor--he is tremendously appealing in THE FUGITIVE. You're so right - he had a difficult task. Charisma enough to carry a series in which he was in virtually every scene, while at the same time being low-key enough that he would not draw attention to himself - which would have been fatal for a fugitive. And that fourth year was a letdown - but, as you suggest, I suspect many series would have killed to have a season as good as that one.